What if your yard or deck or patio or roof line that you want to use for a pergola is not perfectly straight and doesn’t have those nice square corners on all sides? 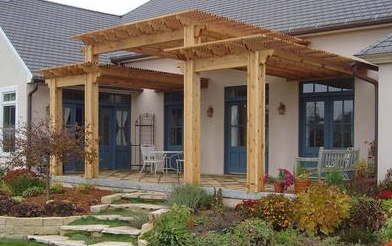 Pergola designs can be created for just about any scenario. Let’s check out a few really nice ones we’ve stumbled across recently. 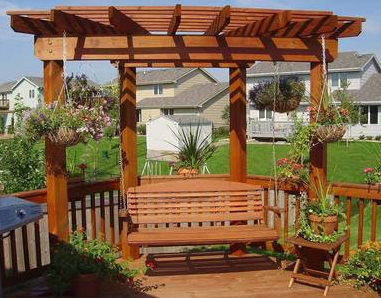 This pergola with a swing is designed into the corner of a deck. It is a four post trapezoid design with the back two posts four feet apart and the front two set at eight feet apart. This ends up with a roof design that looks flared out as the rafters spread out from the shorter back beam to the front. The pergola swing is hung from chains attached to the rafters. 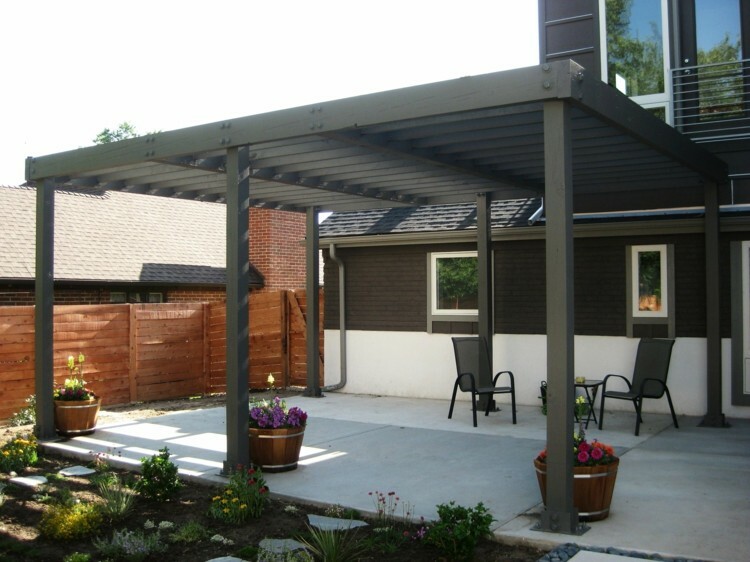 This particular pergola shape is perfect for a smaller corner site. Let’s have more fun with shapes! 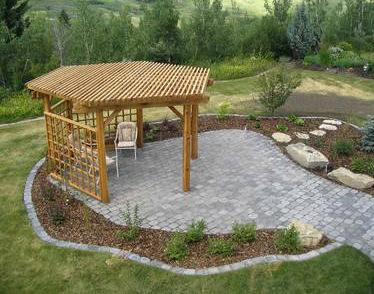 This hexagon pergola at the back end of stone walkway and patio is a creative way to create a shaded seating area in an unusually shaped space. You can still have just two beams placed at what would be the natural ‘front’ and ‘back’ of the pergola. Equal sized rafters would span between the beams and then multiple lengths of slats would fill in the angles on top of the rafters to complete the roof line hexagon. So there would be two additional posts and close to double the number of slat pieces but a hexagon does not need to cost that much more in materials. Some hexagon designs have beams between each post creating a more complete roof line appearance and adding more to the overall cost. This example includes the additional lattice walls attached for more privacy which is another option to consider if that is in your budget. Lattice pieces should be measured out and already put together as wall pieces so that all that needs to be done is to attach them to the posts. Pergola with tiered roof levels. Now this one is a really cool and unusual design that solves the problem of multiple roof levels on a house. This ends up looking like three pergolas that blend into one and in the planning and building we would agree that is the best approach. There are indeed three separate roof lines to secure as well as three ledger boards attached to the house. Stepping back you can see why a single six post pergola would not be as functional or intriguing. First of all, they could not have had one go all the way across the patio surface at the higher roof height. It would have looked much too out of sorts with the lower roof lines on either side. Conversely, one long lower level pergola would have appeared too squat and crowded in the space. This solution requires a bit more work and material budget but in the long run is the perfect solution of form and function. 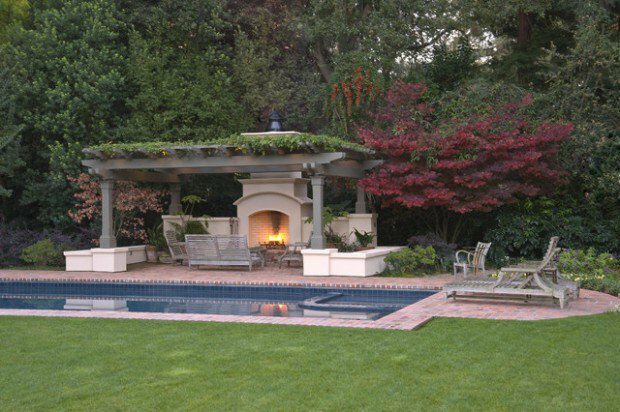 If you want to have a pergola that stands out and plays well with the aesthetic of your garden or your house, you can select a curved pergola design. While being beautiful and unique in their design they can provide a more aesthetic and intimate look and feel to the seating areas below them. To build them you can use materials such as curved lattices made with different shapes such as basket-weave or deep-v-shaped. This will give an increased space between the roof and the floor and still feel like the intimate and cozy place it’s meant to be. What better than having a relaxed day by the pool below a beautiful pergola? If you have enough space around your pool or you have a pool that’s quite large, you can set up a beautiful yet simple pergola to enhance this area. You can go full classic with this kind of pergola in regards to materials and design and you can add to them appropriate elements to the pool area, such as shower spaces and tiled flooring. A very nice and romantic variation of the pergola by the pool is the hot tub pergola, which is a great addition to your garden if there is not too much free space available. Add details for embellishment or privacy and you’ll get yourself a small and cute relaxing place. You know about stone or wooden walkways to embellish your garden, but, what about a path of pergolas? If your house has a very large garden it’s the perfect place to build disconnected pergolas (another name they’re known for). 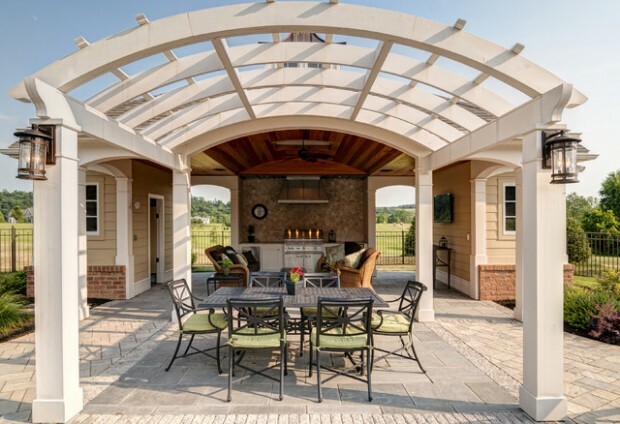 The simplest explanation for this design choice is the following: These are just regular pergolas that can be spread across a large garden, providing multiple small places to hang out and making seating arrangements easier when you’re giving a party or hosting a meeting. You and your guests will enjoy an amazing view of all the pergolas making a path across your garden. Did you know that pergolas don’t need to be always made of wood? Enter contemporary style pergolas. By replacing the wood beams and traditional meshes and lattices with lightweight aluminum poles and meshes made of vinyl. The most technical and modern even incorporate retractable tops that let you choose if you want or not a shade for the day. If you stay on the simple side of the contemporary style, you can build a pergola in a very cheap manner with prefabricated materials. Besides, these materials are better at bearing the weather and you can have more control upon aspects such as colors and sizes. No matter what is the architecture of your house or the idea you have for your garden, be certain that there is at least one type of pergola that will fit what you have in mind and your budget. 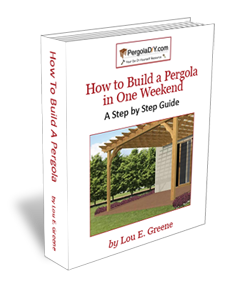 Join Our Pergola Building Preparation E-Course! Sign up with your email to receive the 3 week E-Course delivered to your inbox. As a bonus you will receive a free pergola plan. Even if you have a yard that is unusual like these, our lessons will take you right through to designing, creating plans and preparing your site to build a pergola. We hope these unique designs have shown you that you really can let your imagination roam!